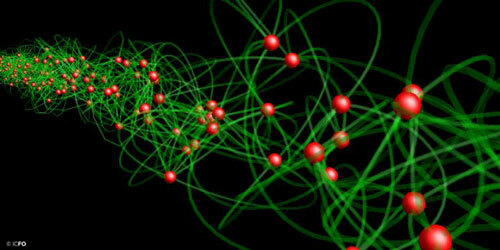 (Nanowerk News) In a recent study published in Physical Review Letters ("Macroscopic quantum state analyzed particle by particle"), the research group led by ICREA Prof at ICFO Morgan Mitchell has detected, for the first time, entanglement among individual photon pairs in a beam of squeezed light. Quantum entanglement is always related to the microscopic world, but it also has striking macroscopic effects, such as the squeezing of light or superconductivity, a physical phenomenon that allows high-speed trains to levitate. Squeezed light is not physically compressed but it is it manipulated in such a way that one of its properties is super well defined, for example its polarization. Compared with normal light, laser light, composed of independent photons, has an extremely small but nonzero polarization uncertainty. This uncertainty or "quantum noise" is directly linked to the existence of photons, the smallest energy quanta of light. Now, squeezed light has an uncertainty that is farther below this level. Therefore, in optical communications, squeezed light can help transmit much weaker signals with the same signal to noise ratio and the same light power. It can also be used to distribute secret keys to two distant parties through quantum cryptography. Although it has long been believed that many macroscopic phenomena are caused by large-scale entanglement, up to now, this link has only been proposed theoretically. On the other hand, current computer simulations of entangled particles have not been able to help discern any new properties regarding this relationship since the memory and processor time required grow exponentially with the number of entangled particles, thus limiting the studies to only a few particles. Albeit these issues, spin-squeezing experiments have been able to claim the observation of many entangled atoms, but these claims are indirect since they have measured the macroscopic properties and used theory to infer the entanglement. ICREA Prof at ICFO Morgan Mitchell comments, "I am continually amazed by quantum mechanics. When the theoretical predictions came out, saying that there should be a sea of entangled particles inside a squeezed state, I was floored. I knew we had to do an experiment to see this up close". Now for the first time, ICFO scientists have been able to directly and experimentally confirm this link. To do so, they fabricated a beam of squeezed light, predicted to consist almost entirely of entangled photons. Then they extracted a small number of photons at random and measured their quantum state, in particular the joint polarization state of photon pairs. After overcoming many experimental obstacles, they found, in agreement with theoretical predictions, that any two photons near each other are entangled. By changing the density of the beam, they also observed effects of entanglement monogamy, where particles can be strongly entangled only if they have few entanglement partners. Federica Beduini states that "the experiment was terribly difficult; we had to combine squeezing with entangled-photon detection. There were many unsolved problems. We had to invent many things, like super-narrow optical filters, just to make the experiment possible". The results of this study show promising advances for other macroscopic many-body systems and quantum gases such as Bose-Einstein condensates for the future study of superconductivity and superfluidity, optical communications, or the research and development of qubits for quantum computing.